Saint Mary’s Cemetery on Spa Road and West Street was assembled over a period of forty-three years from four parcels of land. In the late seventeenth century a Catholic cemetery grew up on the Carroll family plantation—some two acres in the old “Annapolis Quarter.” In 1856, three years after the beginning of the parish of St. Mary’s, the burial ground was deeded to the Redemptorists together with surrounding property, eventually culminating in over two hundred acres of farmland. When the Carroll House and surrounding grounds were deeded to the Redemptorists, the church yard was used as a cemetery. But by 1859, a more formal burial ground was erected fronting on Spa Creek (Severn River), within the precincts of St. Mary’s Church off Duke of Gloucester Street. Scores of Redemptorist priests, brothers, novices, oblates and students now repose in this cemetery. Parishioners began to sell the deeds of these parcels to the Redemptorists beginning in 1858, and it is the first lot that was consecrated a Catholic burial ground. The remaining acreage has always been open to lay Catholics and non-Catholics. Father Francis Schwallenberg, who said his first Mass at St. Mary’s in 1897 is buried in the cemetery, along with School Sisters of Notre Dame. 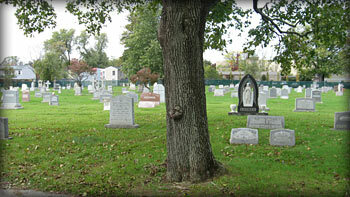 In 1997, the management of St. Mary’s Cemetery was turned over to the Administrative Office of the Redemptorist Cemeteries at Sacred Heart of Jesus in Baltimore.